Storage Instruction: Store in a cool and dry place. Once opened, consume within three days. Ingredients: Maltose, Glutinous Rice Powder, Sugar, Water, Oligosaccharides, Potato Powder, Strawberry (1.7%), Glucose, Strawberry Flavouring (0.2%), Beef Gelatine, Thickening Agents (E415, E1442), Preservative (E202), Emulsifier (E471), Anti-oxidant (E330), Colours (E129, E127). 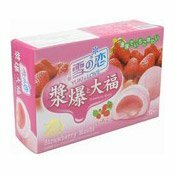 Simply enter your details below and we will send you an e-mail when “Yuki & Love Strawberry Mochi (雪之戀草莓大福)” is back in stock!